Cabins in this category are built for three people but we normally sell them as double cabins. Cabin 217 is a bit more spacious then the other cabins in this category (215,213,311,2009 and 207). If you are three people travelling togheter - please ask for a special rate on these cabins. Or if you want to bring a child we can offer a good rate. Send us an email at post@verktoyas.no and ask for an offer. 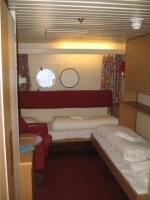 The cabins has a window (exept Cabin no 200), a bathroom with shower and toilet, and they are all on B-deck which gives you excellent and quick access to the demonstration room! These cabins are only sold as double or triple.